Near Death is an interesting attempt at a survival game that doesn't class itself as one. 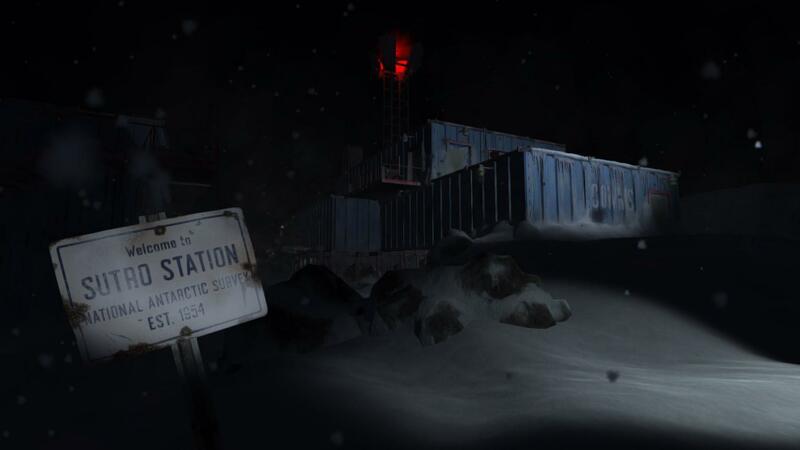 After your plane crash-lands in Antarctica, you find yourself stranded and alone at an abandoned research facility in the midst of a deadly blizzard. I love the mystery of the intro, as you hear you're going down, but instead of an intro video it's a voice-over as it shows you statistics like the temperature and wind chill. It was a very cool way to do it, to get you thinking right away. It actually reminds me of The Long Dark quite a bit, similar sort of icy setting and the need to stay warm. This, however, is a finished game and not Early Access like TLD is. The developers claim it doesn't fall into any definable genre, but I disagree. It firmly feels like a mix between an adventure game and a survival game. Survival due to battling the elements and adventure since it seems to have a story behind it and you have objectives. I really like how the game is relying on audio cues to know when to warm up, instead of some UI thermostat for your character she starts making chilly noises. This is the type of game that actually makes me feel cold playing it, I actually had the shivers a few times when my character did as the atmosphere is very well crafted. The ambient music is pretty incredible to listen to too, very impressed. Gives the game a fantastic immersive feel to it, without the audio getting in the way of the overall experience. Perfectly compliments the gameplay. Performance wise, on my 980ti I haven't had a problem. Seems to be a mostly solid 60FPS with no option to turn VSYNC off, I say mostly as it has drops to 56FPS at times. That's one thing the game is lacking, it has no real graphical options. It works fine with dual monitors too, starts on the correct monitor and doesn't give me some funky resolution. That's always fantastic to see working correctly. Will give it some more detailed thoughts in future when I have been able to put more time into it. Liking it so far! You can find Near Death on Steam. liamdawe Seems to be a mostly solid 60FPS with no option to turn VSYNC off, I say mostly as it has drops to 56FPS at times. Sounds more like a limiter than v-sync. Otherwise you'd drop down to 30 as soon as it goes below 60. Wow this looks really interesting. I've always had a fascination for the atmosphere that comes with wind and cold, but don't like the meaninglessness of pure survival games. So this game here, with a story and even a female protagonist, well this one goes straight onto my wishlist. I won’t bother looking at it until they implement proper options and/or optimise their game. tuubi Otherwise you'd drop down to 30 as soon as it goes below 60. ... But are there really any story to speak of? Neither the game description nor the videos on Steam, or any of the user "reviews" implies so? Indeed with vsync it should drop directly to 30 FPS. stan Indeed with vsync it should drop directly to 30 FPS. No, it won't. I've run VSYNC in many games, it means it cannot go higher than your refresh rate. Yes it's exactly how traditional v-sync works. If a v-synced app misses a v-blank, it needs to wait for the next one. So in practice whenever a game cannot manage to draw a finished frame in time for each refresh at 60Hz (or whatever your monitor refresh rate happens to be) it can only display at half that rate, causing very noticeable judder. Of course this is why there's stuff like Nvidia's Adaptive v-sync, which simply disables syncing whenever the FPS goes below the screen refresh rate, but what I described is certainly how most of my V-synced games still work. Easy to check with an FPS counter. BTW, seems like Adaptive v-sync can be enabled globally in Nvidia's Windows control panel, but not in Linux. And they've had a feature request pending for years. Feel free to enlighten me if I'm wrong, or if I'm simply working on outdated information. Then I'd be happy to be enlightened by him. Well I’ve programmed games and played many games and yes that’s what the vsync option does. Some games implement triple-buffering instead of double-buffering and then you won’t see that sudden jump to 30 FPS, but they are rare.